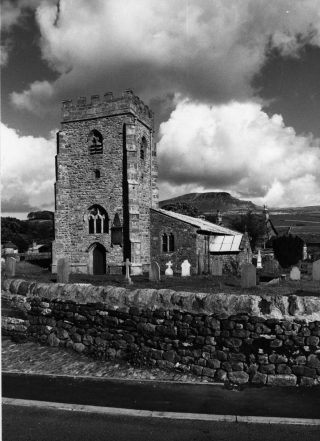 Photograph of St Oswalds Church. Photograph of the inside of St Oswalds Church showing the alterations that took place in 1870. The church was probably built in about 1100 in the reign of Henry I. Extensions were added to the existing Nave and Aisles at the end of the 14th Century to form the Chancel, in such a way that Nave, Chancel and Aisles are all under one roof.At the same time theTower, forty one feet high, was added. The SOUTH DOORWAY is Norman, with the typical “Chevron and Dog Tooth” moulding on the inner arch, and with marks on the side stones made by people sharpening their arrow heads. Inside the church, the ARCADES are both Norman, on the North side, three bays with columns and unmoulded arches, and on the South side, four bays with slightly differently detailed columns, and arches with one slight chamfer, indicating the possible Transitional period. The bays further East on both sides are Perpendicular with the usual octagonal peirs (supports) and double-chamfered arches. The FONT is Norman, tub-shaped, with Herringbone decoration. un-cusped. (Cusps are the projecting points between small arcs). The WEST WINDOW contains fragments of pre-Reformation stained glass. Shown in the windows are Thomas a Beckett, wearing a mitre and holding a Pastoral Cross; the coat of arms of Jervaulx Abbey in Wensleydale (the Abbey owned land in Horton); and the figure of a Saint. The CHANCEL WINDOW, with three lights, shows the Nativity, the Crucifixion, and the Ascension. The two-light window at the East end of the South aisle shows the Raising of the Widow’s Son at Nain. Other windows on the North and South sides are filled with tinted glass in a Chevron design. The BELLS; for many years there were three bells of which the Tenor is ‘ dated 1614. Papers concerning the bells tell us that “the Middle Bell at Horton was cast anew in1776.In 1770 the Little Bell was cast anew. Paid for ye casting £10.1.2, carrying and re-carrying from York to Settle £2.0.0”. In 2010 a further two bells were added to the frame to make up a full ring. Several interesting memorial brasses can be seen in the North Aisle, including one in memory of John Armistead of Dubcoat, who endowed “The Free Grammar School at Horton”. The School was, until 1854, the house in the corner of the churchyard. Alterations to the Church were made in 1823. 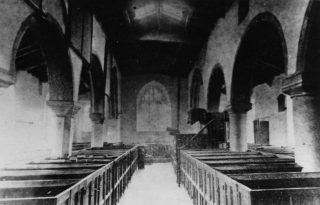 Box pews were built, and a Three-decker pulpit was erected. At the West end, a singer’s gallery was replaced. In 1879, the box pews and three-decker pulpit were removed when further consid­erable alterations took place. 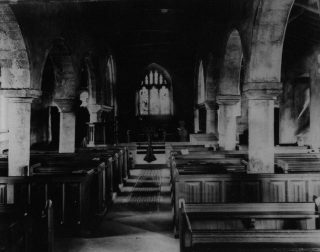 At this time, the present oak pews, pulpit, lectern, screens and reredos were put in.